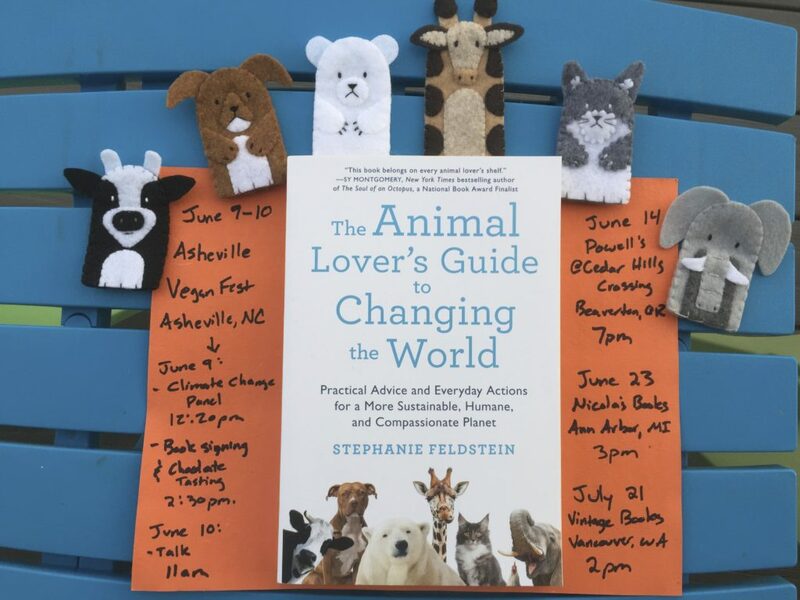 The Animal Lover’s Guide to Changing the World is now out in the world! Here’s where you can catch me talking about turning your love of animals into action and signing books. Join me at the Asheville VeganFest for the Veganism, Environmentalism, and Climate Change Panel Discussion from 1:30-3:30 p.m. followed by a vegan chocolate tasting and book signing. The Animal Lover’s Guide to Changing the World will be available for purchase throughout the festival. Asheville VeganFest (June 8-10), hosted by the largest no-kill animal rescue organization in North Carolina, Brother Wolf Animal Rescue, is quickly growing to be the largest vegan festival in the Southeast. All VeganFest events are free and open to the public, except for ticketed benefit shows on Friday and Saturday nights. The outdoor festival on Sunday will take place at Pack Square Park. Author talk and book signing. I’ll be joined by the Portland Animal Welfare Team (PAW Team) to highlight their important work providing free veterinary care to the pets of people who are experiencing homelessness or extreme poverty. Author talk and book signing. 20% of the sales of the book will go to the Humane Society of Huron Valley’s Bountiful Bowls Program, benefitting Washtenaw County and Plymouth residents who are having difficulty meeting the nutritional needs of their dog or cat due to financial burden. Author talk and book signing. The event is co-sponsored by Clark County Green Neighbors.